Today's cook was the result of feeling antsy to cook something without the benefit of planning to come up with something all that creative. I ran off to the grocery store while my wife fed the kids lunch. The beef short ribs caught my eye. So did a big old London broil (foreshadowing for future projects?). However, I settled on getting some wings and some pork loin country ribs. I remember reading about country ribs. I bought them because I was curious to figure out what they were. They had both "bone-in" and "boneless." To me ribs ARE bone, right? So I got the bone-in. Again, since I hadn't put much thought into all this I just rubbed them in brown sugar and salt. 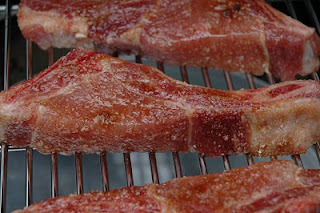 After the coals were doing their thing, I threw them on my new adjustable rig from ceramicgrillstore.com (which I love). After about 3 hours indirect at a dome temp of 250f I slapped some bbq sauce on them and added the wings to the Egg. 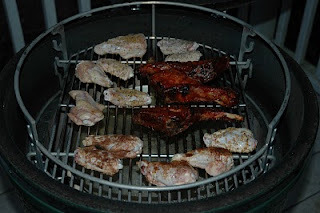 I've not done much with wings before so I experimented with several different rubs. On an impulse today I bought some Asian five spice thing that made the back porch smell really good, but didn't do much for the wings bearing their spice. Both my wife and I liked the wings that had the same treatment as the ribs (salt & brown sugar with some bbq sauce added later). ction and got a very small order of ribs. That plus wings and a baked sweet potato was plenty of food for my wife and me. The ribs came off after about 4 hours. The loin part was a little dry, but came apart very easily. The stuff around the bone was really pretty awesome, I have to say. My wife and I both puzzled as to why you'd go with the boneless variety. Perhaps we'll try that soon for comparison. Fun Saturday spur-of-the-moment kind of cook! Jealous! The adjustable rig is on my "must get soon" list. I can't wait to see more of that bad boy in action. I need to get some country style ribs, we haven't done those in over a year. Yeah the rig is great. I have to say that I have yet to have occasion to need that much cooking space, but know I'll take advantage soon. 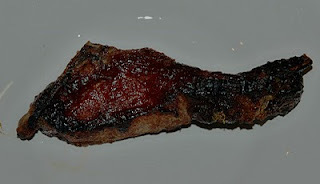 The country style ribs were tasty. Thanks for checking in on me Chris.